TOKYO -- Japan Inc. has $59 billion at stake on the June 23 referendum in the UK, when Britons vote to either leave or stay in the European Union. That's the amount Japanese companies have invested in the UK, which benefits more from Japanese investment than any other country outside Europe apart from the U.S., according to figures compiled by the Japan External Trade Organization. More than 1,300 Japanese companies -- including Toyota Motor Corp. and Nissan Motor Co. -- employ over 140,000 people in the UK, Prime Minister David Cameron said last month. That explains why officials from Prime Minister Shinzo Abe to executives of top Japanese companies have been vocal in their support of Britain staying within the 28-nation trading bloc. Recent polls showing more Britons favored exiting the EU roiled the sterling, which dropped to a three-week low versus the dollar on Monday, while the Bank of England said uncertainty surrounding the vote is damping UK's economic growth. "It would be harder to invest in the country should it vote to leave the EU," said Kazuko Yamazaki, a senior economist at Daiwa Institute of Research Ltd. "Some companies may consider opening other bases around Europe." Should the UK leave the EU, the biggest destination for international direct investment in the bloc risks more than 107,000 manufacturing jobs likely to be created by 2030 because of the deepening of the the single market, the Centre for Economics and Business Research estimates. Hitachi, which opened a train manufacturing facility in the UK last year, is against any split of the UK from Europe as it may threaten exports of trains from its new factory in the country to the continent, CEO Toshiaki Higashihara said last month. The company opened a factory to build trains in Newton Aycliffe in County Durham, England, last year and aims to boost employment to 730 people. "Access to Europe plays a very important role," Higashihara said on May 18. "We are strongly in favor of staying in the EU." During a visit to London in May, Abe said a UK outside the EU would be "less attractive" to Japanese investors, while Nissan CEO Carlos Ghosn has said that Britain as part of EU makes makes the most sense for jobs, trade and costs. Nissan built a factory in the UK three decades ago and exports 80 percent of the cars made there. It employs 8,000 people in the country and has invested more than 3 billion pounds there in total. "We obviously want the Nissan UK plant and engineering center to remain as competitive as possible when compared with other global entities," Ghosn said in a statement in February. "While we remain committed to our existing investment decisions, we will not speculate on the outcome nor what would happen in either scenarios." A representative at Nissan said he has no further comment to add beyond those by the CEO. Toyota Motor Corp., which opened its UK factory in 1992, said future investment in the country would be jeopardized and costs would rise should the country leave the EU, according to Tony Walker, a deputy managing director in the country. The investment programs for the next two to three years are not in danger, he said in March. Toyota exports about 90 percent of cars made in the UK. A representative at Toyota on Tuesday said he has no further comment to add beyond those by the UK executive. Hitachi Chairman Hiroaki Nakanishi said those advocating Brexit have no answer to how the country could negotiate cost-free access to the huge EU market from a position outside it, according to an op-ed in the UK's Mirror newspaper Tuesday. 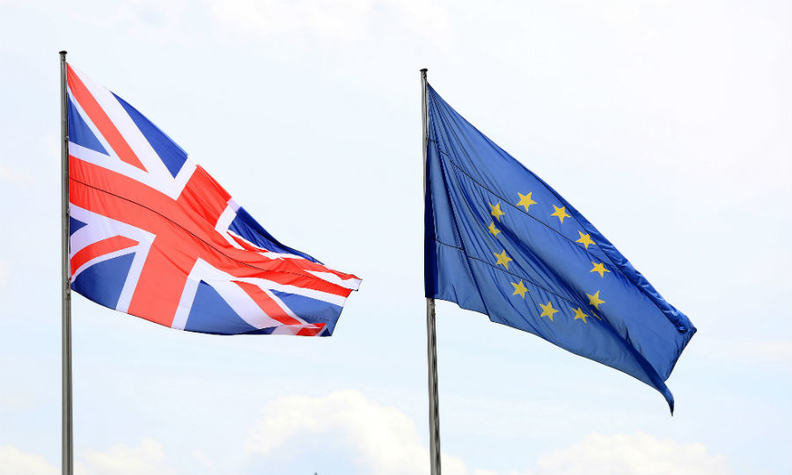 A decision for the UK to exit the EU would result in prolonged uncertainty and would be credit negative for UK-based companies such as the auto, manufacturing, food and beverage, and service sectors, Moody's Investors Service said in March. Many companies would probably curb investments until the implications of a Brexit become clear for trade, investment, regulations and labor costs, it said. Tariffs on traded goods could increase with an exit from the EU, eroding a 10 percent increase in trade the UK may have experienced being in the union, according to Bloomberg Intelligence analyst Chris Rogers. Some showed it was too close to call. The ORB poll for the Daily Telegraph, surveying people who say they will definitely vote in the June 23 referendum, showed Britons planning to vote to remain in the EU at 48 percent, compared with 47 percent intending to leave the bloc.